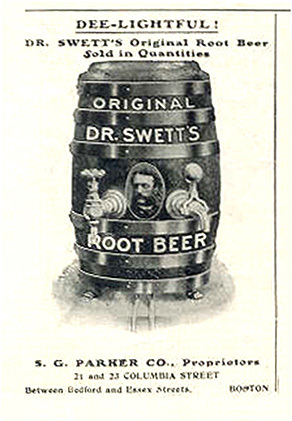 Dr. Swett's Root Beer was originated by Dr. George W. Swett (1834-1924). He owned two large wholesale and retail pharmacies in the 1800's, one in Boston and the other in New York City. His root beer was first sold in little packets of dry ingredients, and as a fountain drink in his pharmacies; then it was shipped to other pharmacies as a syrup to be mixed with soda water; and later it was pre-mixed and sold in bottles. It was not fermented, and contained no alcohol. 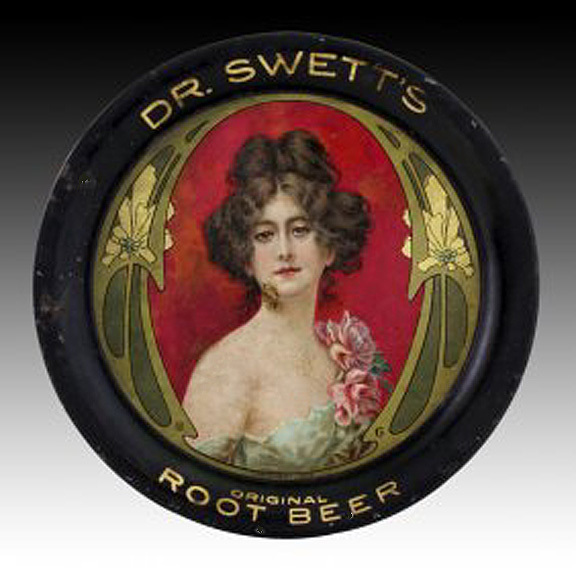 Starting in the late 1800's, Dr. Swett's Root Beer was available throughout the United States. It was produced by franchised bottling companies until the 1950's. 1834. George W. Swett was born in October 1834 in St. Stephen, Charlotte County, New Brunswick, Canada, son of Nathaniel Swett and Amelia L. Hall. [Compiled from Stackpole's Swett Genealogy, the 1851 St. Stephen Census, the 1900 Boston Census, and his death certificate] St. Stephen is just across the international boundary (St. Croix River) from Calais, Washington County, Maine. 1845. 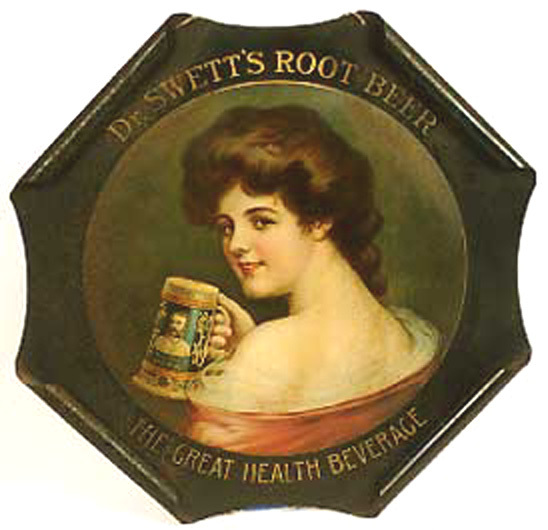 Many examples of company advertising state that Dr. Swett's Root Beer was established in 1845 when he was 11 years old, and although this claim has not been proved, it seems likely that he was experimenting with various concoctions when he was a boy and perhaps even selling something like root beer. 1858. His death notice says George W. Swett graduated from New York University in 1858, but I have not been able to confirm it. The 1900 Boston Census states that he immigrated to the United States in 1860. Dr. Swett published a brochure entitled "The Illuminated White Pine Alphabet" about 1867. It is 5 inches wide, 6 3/4 inches high, and has 16 pages plus the paper covers for a total of 20 pages. [Auctioned on eBay] It looks like a book intended for children. The cover shows a woman reading to children. One page has the alphabet in capital letters and small-case letters. Eight pages have letters of the alphabet (each letter is accompanied by a drawing and a poem) -- but the entire brochure is advertising for patent medicines sold by The New England Botanic Depot. One example of the "alphabet" pages in this brochure will suffice. The following paragraphs are condensed extracts of the advertising in this brochure. I have omitted the testimonials by satisfied customers and endorsements by physicians. The price for each of these four medicines was one dollar per bottle or six bottles for five dollars. All four medicines were prepared at the New England Botanic Depot, 106 Hanover Street, Boston, Mass., under the supervision of Geo. W. Swett, M.D., Proprietor. Dr. J. W. Poland's White Pine Compound, the great New England remedy, cures sore throat, colds, cough, diphtheria, bronchitis, spitting of blood, and pulmonary affections generally. It is a remarkable remedy for kidney complaints, diabetes, difficulty in voiding urine, bleeding from the kidneys and bladder, gravel, and other complaints. Dr. J. W. Poland's Humor Doctor, an invaluable medicine for purifying the blood, is a positive remedy for all kinds of humors, particularly erysipelas, nettle rash, scrofula, salt-rheum, carbuncles, boils and piles, ulcers and all obstinate affections of the skin; inflammatory or chronic rheumatism, chronic diarrhea, mercurial diseases, and every taint of the system; dyspepsia, and those affections originating in the derangement of the digestive organs, viz. : bilious complaints, neuralgia, and nervous affections, headache, languor, and depression of spirits, loss of appetite, constipation. Fellow's Worm Lozenges are a remarkable power in expelling worms, with pleasant taste and perfect safety. They contain no mercury, no mineral, no turpentine, no oil of wormseed, no poison, nothing injurious. They are entirely vegetable, and prepared with great care from the concentrated extracts of two plants. They do not act as a purgative or emetic, will not debilitate, and are so simple an infant may devour a whole box without harm, and will at the same time expel the worms in an extraordinary manner. Removes the Long Thread Worm, the Maw or Threadworm, the Long Round Worm, and the Long Tape Worm (each type of worm is briefly described). Dr. Geo. W. Swett's Female Strengthening Cordial, a specific remedy for diseases of the reproductive organs, imparts tone and vigor to the uterus, and gives renewed vitality to the whole system. All cases of debility peculiar to females will find a sovereign remedy in this compound. The following affections are among those for which it is peculiarly adapted, -- painful menstrual discharges, suppression of the menses, profuse menstruation, leucorrhoea or whites, ulcerated uterus, &c.
It is worth noting that "The Illuminated White Pine Alphabet" doesn't mention root beer. 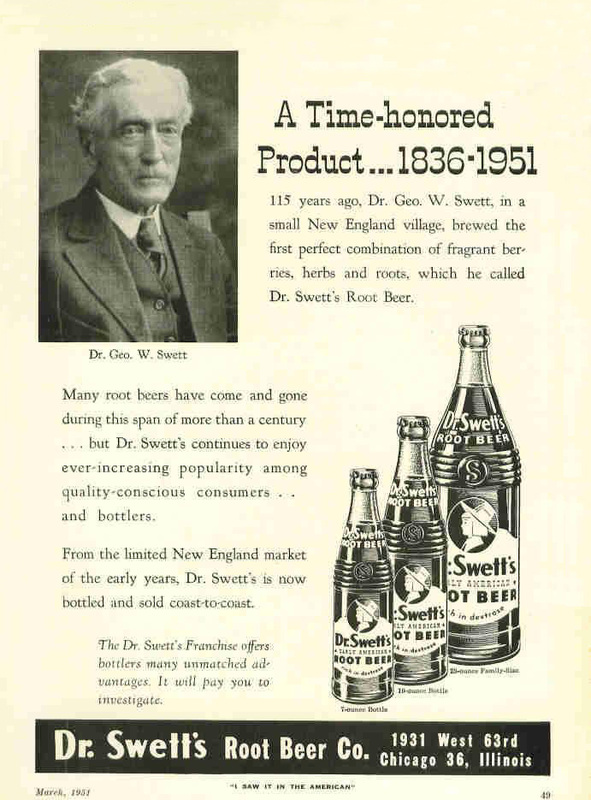 Of course, Dr. Swett may have been selling such a drink at that time, and perhaps calling it something other than root beer. This drawing is from a black-and-white edition of "The Illuminated White Pine Alphabet" published about 1870. 1876. Hires Root Beer made its debut in 1876 at the U. S. Centennial Exposition in Philadelphia, along with Alexander Graham Bell's telephone, the Remington typewriter, and Heinz Ketchup. At that time, Charles Elmer Hires (1851-1937) was a young pharmacist in Philadelphia. There are several legends about when and how he discovered or invented his formula for "Hires Herb Tea" as early as 1866 (when he was 15 years old). All of these legends are questionable, but he did obtain a patent for "Hires Root Beer" during or prior to 1876. 1885. Harper's Bazaar, Vol. XVIII, No. 27, New York, Saturday, July 4, 1885. HIRE'S IMPROVED ROOT BEER Packages 25¢. Makes 5 gallons of a delicious, sparkling, and wholesome beverage. Sold by all druggists, or sent by mail on receipt of 25¢. C. E. HIRES, 48 N. Del. Ave., Phila., Pa.
DR. SWETT'S "ROOT BEER" Packages contain Sarsaparilla, Life of Man, Wintergreen, Juniper, &c. Health and Pleasure. It acts mildly and beneficially on the Stomach, Liver, and Kidneys. Packages to make 5 gallons, 25¢; by mail, 6¢ extra. 4 packages, $1.00, prepaid. Prepared and put up at the NEW ENGLAND BOTANIC DEPOT, 245 Washington St., Boston. GEO. W. SWETT, M.D., Prop. 1888. 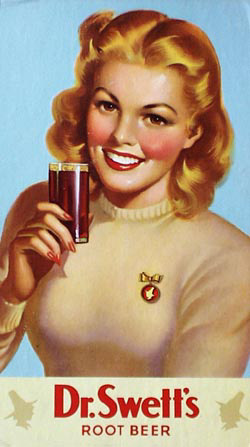 Dr. Swett's Root Beer was advertised by trading cards showing men and women tennis players in rather comic poses. I have three different pictures, and have heard there may have been as many as six. Each card is a little over 5 by 3 1/4 inches. On the front of each card, in the lower left corner, in very small print, is the notice: "Copyright 1888 by the Buffords Sons Lith. Co."
On the back of each card is a poem that will never take a prize for poetry but does establish the fact that Dr. Swett's Root Beer was sold on draught at the New England Botanic Depot in 1888. Note that it doesn't say anything about selling ready-to-drink root beer in bottles, and the implication that Dr. Swett's Root Beer was previously known as Dr. Swett's Excelsior Beer. And make the head feel bright and clear? A glass of "DR. SWETT'S ROOT BEER." Is sure the drooping heart to cheer? And give you strength to fill your sphere? And recommend it far and near? 'Tis "DR. SWETT'S EXCELSIOR BEER." The statement "material put up by the gallon or barrel" indicates that distribution of a liquid concentrate (syrup) had replaced the packets of dry ingredients. Use of the word "temperance" dates this trading card no earlier than 1873 and no later than 1919. The Women's Christian Temperance Union (WCTU) developed out of the Women's Temperance Crusade of 1873. During this campaign, women church members went into saloons, sang hymns, prayed, and asked the saloonkeepers to stop selling liquor. The Temperance Crusade swept over 23 states, and resulted in the closing of thousands of places that sold liquor throughout the nation. The WCTU grew rapidly, and its influence increased with its growth. It worked through schools, churches, and other groups, toward the total prohibition of alcoholic beverages. 1890. The Boston Directory for 1890 has: George W. Swett, drugs and medicines, 245 Washington Street, Boston, 28 Worchester Square, Boston, and 29 Park Row, New York. The liquid concentrate (syrup) was mixed with soda water at drugstores and soda fountains. This stoneware syrup dispenser would be readily available behind the counter, and can probably be dated to about 1890. This Dr. Swett's Root Beer pottery mug was found in a Rockville, Connecticut, dump that was closed in 1910. It was found under 10 feet of debris. [auctioned on eBay] Although it can only be positively dated as "no later than 1910," it probably was made about 1890. 1892. William Painter, a Baltimore machine shop operator, was awarded a patent on the crown-cork bottle seal, an invention that quickly became a standard for the industry and replaced over a thousand different types of bottle sealing devices in use at the time. [The Museum of Beverage Containers and Advertising, Soda Bottle History] Someone started calling the crimped metal crown-corks "bottle-caps" and the name stuck. The ready-to-drink version of Dr. Swett's Root Beer was sold in earthenware (also called stoneware or ceramic) bottles, probably before 1892, because I have two of them with wire-clamp cork retainers instead of bottle-caps. Precise dating of these bottles is difficult. I keep hoping to find one that has the date of manufacture on it. Their characteristic buff-colored body and caramel-colored upper part identify them as Bristol-style bottles. Bristol-style bottles were widely used until the late 1870's. Thereafter, they were gradually replaced by glass bottles, but they were still being used in England in the 1920's. 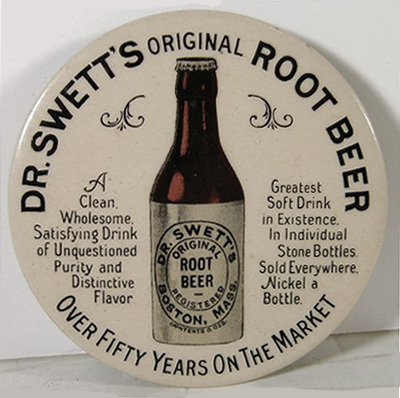 The label on Dr. Swett's earthenware bottles is simply black lines and lettering -- an oval within an oval, with the words "Dr. Swett's original root beer, registered, Boston, Mass., contents 8 fluid ounces." As shown by the back of this three-inch diameter celluloid mirror, Dr. Swett's Root Beer was sold in earthenware bottles with bottle caps. Because company advertising said it was established in 1845, the statement "Over fifty years on the market" indicates that these bottles with bottle caps should be dated after 1895. 1906. Congress passed the first Pure Food and Drug Act in 1906, including provisions that were intended to stop the fraudulent advertising of patent medicines and require open disclosure of their ingredients, because so many patent medicines included drugs such as opium, cocaine, and arsenic. Dr. George W. Swett was 72 years old at that time and had sold patent medicines since 1860, so some response from him to the passage of these laws might be expected. The following four-page brochure can be dated about 1906 because it includes the statement: "This [Root Beer] will stand the test of all the pure food laws in existence." This is the earliest example I have seen of the motto "From Childhood to Old Age" and the logo of a shadowy old man in the background drinking from a glass, with a young boy in the foreground holding a glass and looking at you. The claim: "On the market sixty years" is part of the legend that Dr. Swett created his root beer in 1845 when he was 11 years old. Made from the juices of such beneficial berries, barks, roots and herbs as Checkerberry, Sweet Birch, Sassafras, Sarsaparilla, Spikenard, Juniper, Wintergreen, Ginger and Hops. Beer made from this extract is in every respect the most refreshing and beneficial drink of its kind manufactured. Its medicinal properties render it exceedingly valuable in any disorder of the Stomach, Liver and Kidneys, a free use of it keeping those important organs in a healthy condition. This Root Beer was first offered to the public of Boston more than 60 years ago; each year adds to its popularity and reputation for being the purest and most healthful of all temperance drinks. The medicinal properties of these roots and herbs are perhaps not generally known. The medicinal properties of the ingredients from which this extract is made are given on the last page of this folder. The statement "This Root Beer was first offered to the public of Boston more than 60 years ago" is highly questionable, even if he did create it in 1845, because the 1900 Census states that he immigrated to the United States in 1860.
quenched by home made Root Beer. A half century and more ago a little youngster roamed the Massachusetts hills with an odd fancy for collecting herbs and carrying them home to his mother. Sometimes his patient mother insisted that the herbs might be of doubtful origin, but the little fellow always insisted that they may be cooked up into some sort of brew that would be better even than the one he had the last time. Every day he went farther into the hills, and once in a long time he came upon a new thing that seemed a savory bit to add to his brew. He knew the home of all the checkerberries, and when they grew ripest. He could tell the shadowy little hill where the sassafras grew, and the pleasure to be derived from digging into the soil for the red-brown roots. He found the dandelion with its fuzzy yellow top, and it came under his eye for the herb brew. And the juniper held its special charm. All these went into the little basket that the youngster carried under his arm, and it wasn't very long until the mother found that she was becoming almost as much interested in the "root beer" as the little boy. It wasn't long before it was more than an experiment, and the neighbors from far and wide recounted the beverage that little George Swett had found out himself in the woods. Of course there were many village people who indulged in these quiet mixtures of the hills, but they were most of them for medicinal use, and not one of them had the sharp refreshing taste that the little boy's had. This is the story of the beginning of Swett's root beer, and one would almost say, after hearing it first hand from the kindly old doctor, that there is a flavor of all the wood plants in it. Elsewhere there may be rivals in the field, but New England is faithful to Dr. Swett. He has never advertised greatly, and the others have perhaps outstripped him in the race for notoriety in the West, but in his native country the herb brew that contains the essence of his boyhood days is still the favorite. When the youngster grew up he went to college, and then with a liking for medicine, graduated in New York as a physician. Dr. Swett said yesterday, in talking of the beverage, "This will stand the test of all the pure food laws in existence," and at the factory one may get a glimpse of Dr. Swett himself overseeing things, and still looking after the oldest root beer in existence. He wasn't born or raised in Massachusetts, and I have found no evidence that he graduated in New York as a physician, but the legend of "How It Was Found" apparently was told by Dr. Swett himself. Of course, there was no law that required open disclosure of one's personal background -- and patent medicine salesmen were famous for concocting legends as well as medicines. The last page of this little brochure has drawings of eight plants, with brief descriptions of their uses. Hop Flowers have been commonly used as a tonic for the nerves and have also been used in the treatment of Dyspepsia. Spikenard is a New England plant and was much used by the Indians and through them became a home remedy. It is a very pleasant aromatic stimulant and helps digestion. Birch bark depends for its activity on its volatile oil -- has been largely used in domestic practice for its domestic properties. It is also widely employed as a flavoring agent. Checkerberry leaves, found throughout New England, have an aromatic odor and taste due to the Volatile Oil of Wintergreen which they contain and act as a mild stimulant. Juniper is very valuable as a stimulant, stomachic and carminative, also in mild forms of kidney affections. Juniper Berries are gently stimulating and diuretic and like sassafras are largely used as adjuvants. Wintergreen is a diuretic, acting mildly on the kidneys. Sarsaparilla has a world-wide reputation and the American variety which is used in this root beer is considered by many physicians to be far superior to the imported variety. "It is an excellent blood purifier." disagreeable or suggest the taking of medicine. 1906. This ad from the "Wonderland Souvenir Magazine" published by Walter Jacob Music Company of Boston in 1906 shows a two-spigot version of a soda-fountain dispenser. The right spigot was probably for the syrup and the left spigot for the soda water. 1907. This ad appeared in the August 1907 issue of Everyday Housekeeping magazine [sent by Christopher Weide]. Dr. Swett looks to be about 50 years old, which was in 1884, so he apparently sent a younger picture of himself for this ad in 1907. Also note that the same picture was used for the pottery mug that was made about 1890 and the two-spigot soda fountain dispenser in 1906. 1908. The Boston City Directories for 1908 to 1917 have Dr. George W. Swett (Root Beer) at 87 Albany Street. There is no listing for the New England Botanic Depot. DR. SWETT'S ORIGINAL ROOT BEER. The great Health Beverage. Popular on its merits and merits its popularity. Sale in Boston and vicinity greater than all other root beers combined. Dr. Geo. W. Swett Co., 87 Albany St. Tel. Oxford 458. 1918. The Boston City Directory for 1918 has Dr. Swett Root Beer Co., 940-946 Columbus Ave., Sales 10 Post Office Square, Bottling Company 1169 Tremont; Archibald L. Stark president and Frederick E. Houghton treasurer at 10 Post Office Square, Frederick W. Dunn secretary and manager at 940 Columbus Ave., William Y. Ireland treasurer at 1169 Tremont. These listings continue to 1925. 1919. A&W Root Beer began in June 1919 in California. 1919. Dr. Swett's Root Beer was sold by the Tri-State Beverage Company, El Paso, Texas, which was in business from 1919 to 1923. "These bottles are quite unusual in that they are the only ceramic bottles known to have carried the name of an El Paso firm. Ceramic bottles were much more common in the 1830s - 1880 period, although they were still in use in England in the 1920s. Label: under-glaze ink stamp (black). The bottle was marked with a rubber inkpad stamp before it was glazed. The glaze became transparent after firing, allowing the mark to be easily visible. Manufacturer: unknown. Dating: 1919-1923." [Bill Lockhart, Dating Soft Drink Bottles © 2000] Photographs show that these were Bristol-style bottles, identical to the Dr. Swett's earthenware bottles sold elsewhere, except there was also a label on the back -- a triangle within a triangle, with the words "Bottled by Tri-State Beverage Co., El Paso, Tex." 1920. Prohibition. The Eighteenth Amendment to the Constitution of the United States (passed in 1919) prohibited the manufacture, import, export and sale of alcoholic beverages. One of the results was a huge upsurge in demand for non-alcoholic beverages such as root beer. Another result was that many breweries bought franchises to produce non-alcoholic beverages. 1920. The Dr. Swett Root Beer Company of Philadelphia, Pennsylvania, placed a full-page ad in the Philadelphia Record newspaper on 17 June 1920. It shows a clear glass bottle with bottle-cap and paper lable. This is the earliest example of Dr. Swett's Root Beer sold in glass bottles that I have found. Apparently, paper lables have not survived on bottles, but some of the lables have survived because they were never used (auctioned on ebay). 1921. The Dr. Swett Root Beer Company of Portland, Maine, first appears in the city directory of 1921 and disappears from the directories after 1928. The manager was John F. Crane, 60-62 Cross Street. Advertising states that the company was incorporated in June 1900 and was the successor of the C. E. Odiorne Bottling Company. 1924. George W. Swett died 12 March 1924 in Malden, Middlesex, Massachusetts. His death certificate gives his age as 93 years, 21 days (born 20 February 1831), but the 1851 St. Stephen Census has him born in 1834, and the 1900 Boston Census states that he was born in October 1834. Thus he was 89 years old when he died. A petition presented to the Probate Court in New Brunswick by his mother in 1856 after his father died has George William Swett as one of their sons, but his death notice has George Washington Swett. Additional research has shown that he changed his middle name to "Washington" and created the legend that he was born on the 99th anniversary of George Washington's birthday. 1928. In the Portland, Maine, directory of 1928, the Dirigo Bottling Company is listed at 60-62 Cross Street, which was previously the location of Dr. Swett Root Beer Company. [Portland Room, Portland Public Library] Whether Dirigo continued to produce Dr. Swett's Root Beer is presently unknown. 1929. The Great Depression. Many of the little companies that bottled non-alcoholic beverages, pressed by competition from the breweries since 1920 and hit by the Depression in 1929, went out of business in 1929 or shortly thereafter. 1932. The Baker and Malaspina Company of Danbury, Connecticut, was listed in the city directory as a manufacturer of Dr. Swett's Root Beer (among other beverages) from 1924 to 1932. 1934. The End of Prohibition. The 21st Amendment (passed in 1933) repealed the 18th Amendment, thus permitting (again) the legal manufacture, import, export and sale of alcoholic beverages. One result was that breweries went back to making beer and stopped producing non-alcoholic beverages. Another result was that demand for non-alcoholic beverages suddenly declined as people went back to drinking beer. 1934. Applied Color Labeling (ACL) is a baked enamel process. Each color is applied separately and then baked, so the cost of labeling is proportional to the number of colors used, but total cost of manufacture is reduced because ACL is mechanized. It is a benchmark for dating bottles because it was developed in 1934. 1937. Dad's Old Fashioned Root Beer began about 1937 in Chicago (perhaps as early as 1933). 1938. George R. Dunham and his associates sold the Dr. Swett Root Beer Company to a group of four stockholders including Nelson Rockefeller. The new owners retained the Boston facilities as Dr. Swett Root Beer Bottling Company of Boston, Inc., but moved the headquarters to New York City. 1939. Franchises for Dr. Swett's Root Beer were advertised in the First Annual Blue Book of the National Carbonators and Bottlers Association, February 1939. This book contained detailed information on what was available to the bottlers of soft drinks. 1940. Advertisement in the Second Annual Blue Book of the National Carbonators and Bottlers Association, February 1940. Note the change of address from Boston to Rockefeller Plaza, New York. Nelson Rockefeller was the main shareholder in the new company. The 1939 and 1940 advertisements in the National Carbonators Association Blue Book show manufactured glass bottles with five rings at the shoulder, bottle-caps, and paper labels. The logo of the shadowy old man and the young boy remained unchanged. 1940. New logo. The next illustration is the top part of a one-page advertising handout. A scanned copy of the entire page was sent to me by Peter Hannon, who found it among his mother's souvenirs of the 1940 New York World's Fair. The layout probably was based on the 1925 letterhead -- the left margin has five drawings of herbs used in Dr. Swett's Root Beer, each with a brief description of its medicinal properties. The modernized logo is a middle-aged man and a boy drinking from glasses. The motto "From Childhood to Old Age" is inside the top of the logo. I have copied the text of the handout, because the type is too small to read online. The hero of our story, and this is a true story, was born upon a little farm near Calais, Maine, on February 22, 1831. He was christened by his happy parents, George Washington Swett, for it was upon this same date ninety-nine years earlier that his illustrious namesake, George Washington, was born. Strange though it may seem, the origin of this delicious and refreshing beverage was largely due to the love of a small boy for his Mother. When this little fellow was but eleven years old his Mother was taken ill, and the village doctor in this small, sparsely settled town prescribed certain roots and herbs which were to be steeped or brewed and taken at frequent intervals during the day. Her speedy recovery made such a strong impression upon the boy's mind, that he determined to become more familiar with the uses and beneficial properties of these roots and herbs with which the nearby woods and fields abounded. He acquired an almost uncanny knack for discovering their hiding places. None knew so well as he where the checkerberries grew best or where to dig for the choicest roots of the sassafras. At last, he was satisfied that he had discovered the right combination and in a little store, fitted up in a corner of his home, he brewed and dispensed his "Root Beer". By the time he had finished with such schools as his native town afforded, he had saved sufficient money to pay his way through college and he graduated several years later from New York University as a full-fledged physician. Pursuing his boyhood interest in botanical medicines, he made several changes in his "Root Beer" until its formula was pronounced "perfect". The fact that you can still obtain "DR. SWETT'S ORIGINAL ROOT BEER" which he put on the market over sixty-eight years ago and which is made just as Dr. Swett made it is absolute proof of its merit. 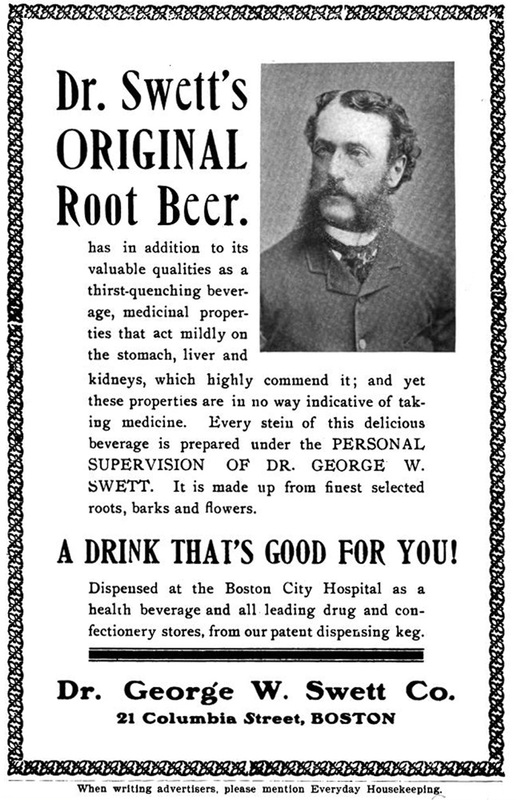 Dr. Swett's Root Beer Bottling Co. of Boston, Inc.
1693 Columbus Avenue, Boston, Mass. It would be interesting to know where the author got this legend in 1940. George W. Swett was born "near" Calais, Maine (just across the St. Croix River in Canada), but he wasn't born on 22 February 1831. His brother Sullivan Clarke Swett was born on 26 April 1831. The statement "on the market over sixty-eight years ago" (that is, before 1872) is reasonable because he was a pharmacist in 1860. 1940. This 7 ounce, clear glass, machine-manufactured Dr. Swett's Root Beer bottle has 3-1-0 embossed on the bottom, which probably means March 1, 1940. It has a narrow ring embossed around the neck, and five such rings around the shoulder superimposed at three points 120 degrees apart by the letter "S" in a circle. This particular bottle is probably a prototype, because it is empty, the cap is in place and shows no sign of ever having been removed, and the line on the back "bottled by" has nothing below it. Interestingly enough, the cap still has the old Dr. Swett's logo. I also have a 28 ounce bottle of identical design that was produced in April 1940 for the Dr. Swett's Root Beer Bottling Company of Philadelphia. These bottles have red and yellow Applied Color Labeling: "Dr. Swett's Original Root Beer" on the neck, the label, and the back. A circle at the top of the label surrounds the new logo of a middle-aged man and a boy drinking from glasses. Below the circle is a curved banner with the motto "From Childhood to Old Age" (this motto is also on the back). The bottom of the label has the words "America's Favorite Since 1845." 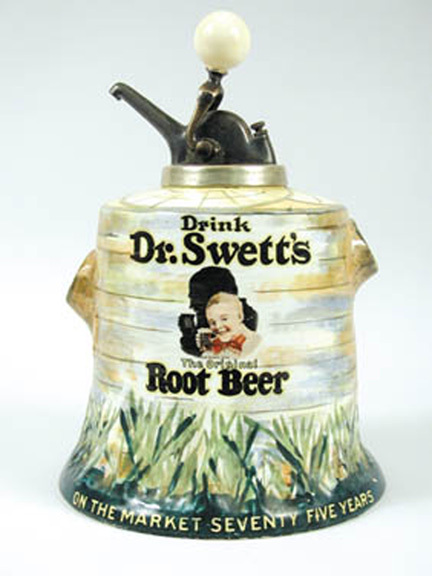 Dr. Swett's Original Root Beer started about 1845 and was in business to about 1890. The Diamond Ginger Ale Co. was the last known distributor for Dr. Swett's Root Beer in 1890. There are no records of what happened to the company, if he died or what. Also, the formula was lost and not found until the late thirties when Dr. Swett's Root Beer Co. was started again. There were four stock holders in the new company. One was Dr. Gadey from whom this bottle was acquired (he lost $60,000). Nelson Rockefeller was a stock holder with over $100,000 invested. They made the Dr. Swett's Root Beer and the new, modern bottle shown here, until the outbreak of World War II put them out of business because of the lack of sugar. The new bottle, believe it or not, cost the company nearly a dollar a piece. So, if a bottle starts off with a two cent deposit and is destroyed, it costs the company nearly a dollar. At this rate a bottle had to be used about 50 times before it started to make money for the company (drinks sold at that time for five cents). The bottlers had all these expensive bottles on hand but had no sugar in which to make the root beer. Since they could not do business, they wanted the money back for the bottles. So the Dr. Swett's Root Beer Co., trying to satisfy the bottlers, attempted to buy up the bottles. This caused the company to go bankrupt. Then Rockefeller bought the other stock holders out at his price and sold the company to Corn Products Co., thereby abolishing the Dr. Swett's Root Beer Company. The statement that Dr. Swett's Root Beer wasn't distributed after 1890 is false. Whoever wrote that didn't know what he was talking about. However, I have no reason to doubt this description of what happened to the company during World War II. The 1942 "S" bottle has the label "Dr. Swett's Early American Root Beer, Rich In Dextose." The statement "rich in dextrose" was an attempt to make a virtue out of necessity. During and for some time after World War II, manufacturers of soft drinks couldn't get cane sugar or beet sugar, so they used dextrose. The sale of Dr. Swett's Root Beer Company to Corn Products Company is significant because corn starch was one of their products. 1946. This 10 ounce bottle with red and yellow Applied Color Labeling was manufactured 3 January 1946. The oval at the top of the label surrounds a simplified drawing of a boy wearing a Pilgrim hat. The label has: "Dr. Swett's Early American Root Beer. Rich in dextrose." The back has: "Dr. Swett's. The famous root beer recipe of Dr. George Washington Swett has been improved to make this pure delicious beverage. Rich in dextrose food-energy sugar." Another 10 ounce bottle of the same design, manufactured 23 March 1946 by Rodgers Bottling Company, Vallejo, California, has yellow Applied Color Labeling. (All the letters on the front label are transparent.) The use of only one color was an obvious attempt to reduce costs. Advertising artwork kept up with the times. This poster is 10 x 17 inches and can be dated after 1945 because it has the Pilgrim Boy logo. 1948. The American Carbonator and Bottler magazine for September 1948 has a full-page ad by Dr. Swett's Root Beer Company, 17 Battery Place, New York 4, N.Y. It shows a drawing of the bottle with the Pilgrim Boy logo and the label "Dr. Swett's Early American Root Beer, Rich in Dextrose." 1949. Dr. Swett's Root Beer Company was sold to the O-So Grape Company between September 1948 and March 1949. The American Carbonator and Bottler magazine for March 1949 has a full-page ad with drawings of both bottles and the statement "Now, since our recent acquisition of Dr. Swett's Root Beer Co., bottlers of both lines find themselves in an exceptionally strong position ..." The Dr. Swetts bottle is identical to the 1946-1948 bottles, and the O-So Grape bottle also has "Rich in Dextrose" on the label. The address of the combined company was 134 South LaSalle St., Chicago 3, Illinois. 1950. Origin of Dr. Swett's Early American Beverages. The American Carbonator and Bottler magazine for September 1950 has a full-page ad with the heading "One Name ... One Quality ... One Bottle ... Ten Flavors." It shows a drawing of a bottle with the Pilgrim Boy logo and the label "Dr. Swett's Early American Beverages." It doesn't list the flavors, and it doesn't mention dextrose. The address is Dr. Swett's Root Beer Co., 1931 West 63rd, Chigago 36, Illinois. 1951. This ad in the American Carbonator and Bottler magazine for March 1951 is the latest known attempt to franchise Dr. Swett's Root Beer. It sets the origin back to 1836, when he was two years old, and features a photograph that may be him but has not been verified. Like the 1946-1949 ads, it has the bottle with the Pilgrim Boy logo and the label "Dr. Swett's Early American Root Beer, Rich in Dextrose." The address is Dr. Swett's Root Beer Co., 1931 West 63rd, Chigago 36, Illinois -- the same company that originated Dr. Swett's Early American Beverages in 1950. They apparently tried to revive Dr. Swett's Root Beer as a separate brand name and not merely one of their ten flavors. 1953. A 10 ounce bottle embossed with the year 1953 has red and yellow Applied Color Labeling: "Dr. Swett's Early American Beverage. Bottled under authority of Dr. Swett's Root Beer Co., Chicago, Ill." It doesn't mention dextrose. It has the Pilgrim boy, but the word "Beverage" means the contents may not have been root beer. Another 10 ounce bottle, manufactured by Anchor Hocking in 1953 for Dr. Swett's Beverages, Westbrook, Maine, has the Pilgrim boy, and the cap has the old Dr. Swett's logo, but according to the seller, the contents were orange soda. 1957. I have seen advertised for sale, but not fully described, a Dr. Swett's Early American Beverage bottle dated 1957. 1959. The most recent example I have seen is a 10 ounce bottle embossed with the year 1959. It has red and yellow Applied Color Labeling: "Dr. Swett's Early American Beverage. Bottled under authority of Dr. Swett's Root Beer Co., Chicago, Ill." It has the Pilgrim boy, but the contents may not have been root beer. Everett S. Stackpole's Swett Genealogy lists among the children of Stephen Swett [#133] and Hannah Knight: "Nathaniel, b. 7 Feb. 1804; m. Amelia, dau. of Capt. John Hall. Ch, George, Emma Amanda, Augusta who m. 24 Oct. 1866 James Reed Kimball, and Clark." [Emphasis added] The 1990 Boston Census shows Dr. George W. Swett living with his widowed sister Emma A. Waldron, and his sister Augusta Kimball is mentioned in his death notice. 1829. George W. Swett's parents were married in St. Stephen, Charlotte County, New Brunswick, Canada. Notice that the Rector spelled their surname SWEET whereas they spelled it SWETT. This pattern occurs many times. 1845. Many examples of company advertising state that Dr. Swett's Root Beer was established in 1845, but this claim has not been proved, and it seems unlikely that he established it when he was 11 years old. 1851. The 1851 Census for St. Stephen, Charlotte County, New Brunswick, Canada [p. 62] has Nathaniel Sweet, aged 49, as head of a household consisting of his wife Amelia (39) and their children: Clarke (20), George (17), Maria (15), Amanda (10), Augusta (7), Charles M. (4) and Henry M. (2). This would indicate that Nathaniel was born in 1802, but other records have his birth in 1804, so "aged 49" is almost certainly a transcription error for "aged 47". 1855. Nathaniel Sweet died in October 1855, aged 51, in Milltown, just a few miles up-river from St. Stephen, Charlotte, New Brunswick, Canada. [Newspapers of New Brunswick, Vol. 15 #2398 HQ 14 November 1855] This shows he was born in 1804. 1856. His widow's petition for administration of the estate of Nathaniel Swett. To the Honourable Harris Hatch LLB, Surrogate Judge of Probate in the County of Charlotte in the Province of NB. The Petition of Amelia Swett of the Parish of Saint Stephen in the said County of Charlotte, Widow, Humbly Shewith: That Nathaniel Swett late of the Parish of Saint Stephen, Cabinet Maker, departed this life on the 29th day of October in the year of our Lord one thousand eight hundred and fifty five at the Parish of Saint Stephen, without having, to the best of the knowledge and belief of your Petitioner, made any will. That the said Nathaniel Swett immediately before his death was inhabitant of the said county of Charlotte and that he died seized or otherwise entitled to real estate of the value of 675 pounds in the said county and personal estate or other value of 125 pounds. That the said Nathaniel Swett left a widow, namely your Petitioner, and four sons Sullivan Clarke Swett, cabinet maker, George William Swett, Charles Nathaniel Swett and Henry Franklin Swett, and three daughters namely Amelia Maria, wife of Edgar McAlister, Emma Amanda Swett and Lucinda Augusta Swett. Given surv[--] and that your Petitioner and the said children all reside at Saint Stephen in the said county. Your Petitioner prays that letters of administration of the estate and effect of the said Nathaniel Swett may be granted to her in the form of [--] and [she] in duty bound will [--]. Dated the sixth day of August, 1856. 1860. His death notice says that George W. Swett graduated from New York University in 1858, but I have not been able to conform it. The 1900 Boston Census states that he immigrated to the United States in 1860. 1860. He was a pharmacist in Boston in 1860. 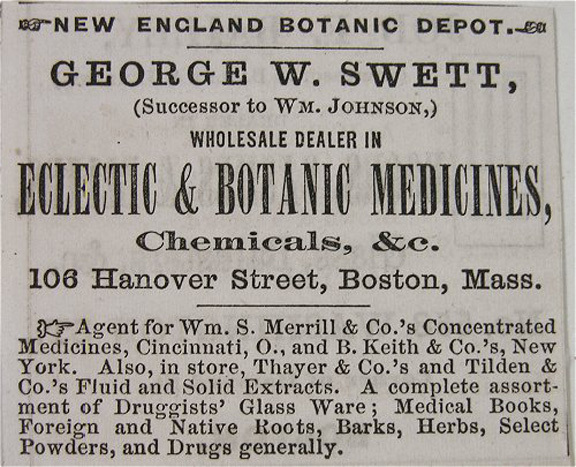 [The Boston Directory has him living at 106 Hanover Street, occupation "botanic medicine" and the Business Directory has a large ad for the "New England Botanic Depot, George W. Swett, Wholesale Dealer of Eclectic & Botanic Medicines, Chemicals, &c," at the same address. Harding, Lemon, P., head of family, paper dealer, married, age 64, born in Massachusetts [Vermont], father born in Vermont, mother born in Massachusetts. Harding, Elizabeth B., wife, keeping house, married, age 62, born in Maine [Massachusetts], parents born in Maine. Swett, Ella E., daughter, at home, married, age 31 , born in Massachusetts, father born in Vermont, mother born in Massachusetts. Swett, George W., son-in-law, wholesale druggist, married, age 40 , born in Maine [New Brunswick, Canada], parents born in Maine. Doane, Lilla E., daughter, at home, married, age 27 , born in Massachusetts, parents born in Massachusetts. Doane, Seth S., son-in-law, insurance broker, married, age 33, born in Massachusetts. 1890. 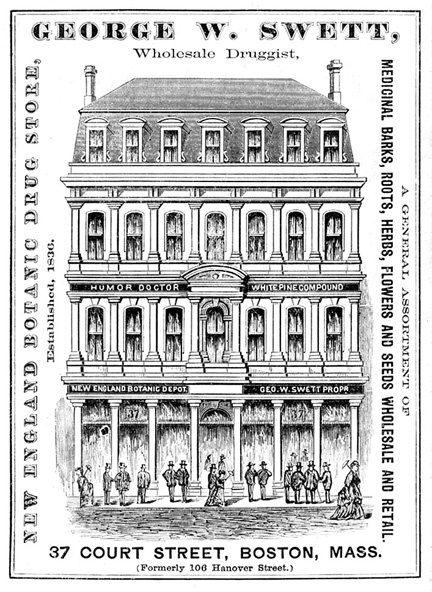 The Boston Directory for 1890 has George W. Swett, drugs and medicines, 245 Washington Street, Boston, 28 Worchester Square, Boston, and 29 Park Row, New York. Waldron, Emma A., head of family, housekeeper, widow, mother of two living children, born August 1841 in Canada, age 58, father and mother born in Maine, year of immigration to United States 1865, Naturalization N/A. Seitchfield, Walter D., son, electrician, married, born October 1869 in California, age 30, father born in Maine, mother born in Canada. Seitchfield, Nathaniel A., son, traveling salesman, single, born October 1873 in California, age 26, father born in Maine, mother born in Canada. Swett, George W., brother, physician, widower, born October 1834 in Canada, age 65, father and mother born in Maine, year of immigration to United States 1860, Naturalization N/A. Note that George W. Swett and his sister Emma didn't have to be naturalized when they immigrated to the United States. This probably means they were considered U. S. citizens because their father and mother were born in Maine and kept their U. S. citizenship while living just across the St. Croix River in Canada. 1922. George W. Swett moved to Malden, Massachusetts, in 1922. [death notice] He apparently lived alone. Residence: 35 Williams St., 6 Ward, Malden. Birthplace: St. Stephens, N. B. Informant: Miss McLeod. Address: 55 Magazine St., Cambridge, Mass. Certification: George W. Swett died 12 March 1924 at his residence, 35 Williams Street, Malden. Cause of death: Arterio sclerosis. Duration: 10 years. Signed: 13 March 1924 by William J. Holland, M.D., 801 Salem St., Malden. Burial: 16 March 1924 in Forest Hills Cemetery, Boston. Undertaker: J. S. Waterman & Sons, Boston. Miss McLeod, the informant who provided information for his death certificate, didn't know much about him. She gave a wrong birth date (20 February 1831) from which his age at death was calculated, didn't know his wife's maiden name, had the wrong maiden name for his mother, and said his parents were born in England. All this goes to show that death certificates are not necessarily accurate. However, she had his birth place, approximate birth date, his father's name and his mother's first name. Together with the St. Stephen, New Brunswick, records, that is enough to verify his parentage. The petition presented to the Probate Court in New Brunswick by his mother in 1856 after his father died has George William Swett as one of their sons, but his own death notice has George Washington Swett. Additional research has shown that he changed his middle name to "Washington" and concocted the legend that he was born on the 99th anniversary of George Washington's birthday. 7. Nathaniel Swett (1804 - 1855) and Amelia L. Hall. Census returns indicate that Dr. George W. Swett did not have any children, and no children are mentioned in his obituary.